Homer Laughlin China Company made so many more sets of dishes other than Fiesta and Harlequin, their most notable patterns. One was Nantucket, manufactured on the Nautilus Eggshell mold with colors of pink, light blue, grey and Jadeite green as trim. This is a pleasing, streamlined floral pattern no doubt manufactured during the 1950s and early 60s. 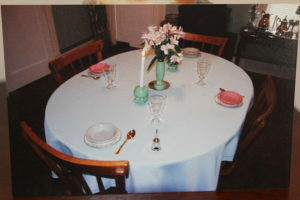 The first in a series of photographs is of a semi-formal table setting. 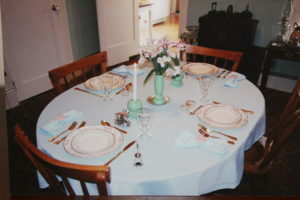 I chose a light blue hemstitched linen look table cloth (Walmart) to show off the blue flowers. The matching napkins are wrapped with pink enamel flower napkin rings (thrift store) to pick up the shade of pink. Nantucket dinner plates and salad plates (thrift store) are at each place setting. Flatware is Golden Royal Plume by Wm. Rogers and Son (antiques store in uptown Butte, Montana), and stemware is Anchor Hocking’s Berwick water goblets (thrift store). At each setting are individual salt and pepper shakers or cellars (both thrift store). The centerpiece is comprised of a Fiesta Sea Mist bud vase (Herberger’s) on a mirrored holder (Ben Franklin Crafts) and matching bulb candlestick holders (J. C. Penney catalog, I think). A silver plated bell by International Silver Company (thrift store) is at the host’s setting, as are a cute pair of silver plated individual salt and pepper shakers in the shape of birds in their own holder (thrift store). The dessert course adds Nantucket bread and butter plates and Fiesta berry bowls in Pearl Gray and Rose (Herberger’s). Please excuse the quality of these photographs. They are pictures of pictures taken in 2008. And, as you can see, this is an early attempt at my table setting skills!